So, you just plunked down for some network attached storage. 500GB? 2TB? Doesn't matter! Even the most cavernous NAS is just a dumb brick—if you don't know what to do with it. Getting a NAS set up as a simple file share is mostly a plug-and-play process. (More on that here.) And in raw form, it's a dead-simple concept: Here's a bunch of storage space that you can share among your home computers, over the network. But with a little work, you can do so much more than that, converting your NAS from a begrudging purchase in the name of caution to a vital piece of your very computing existence. 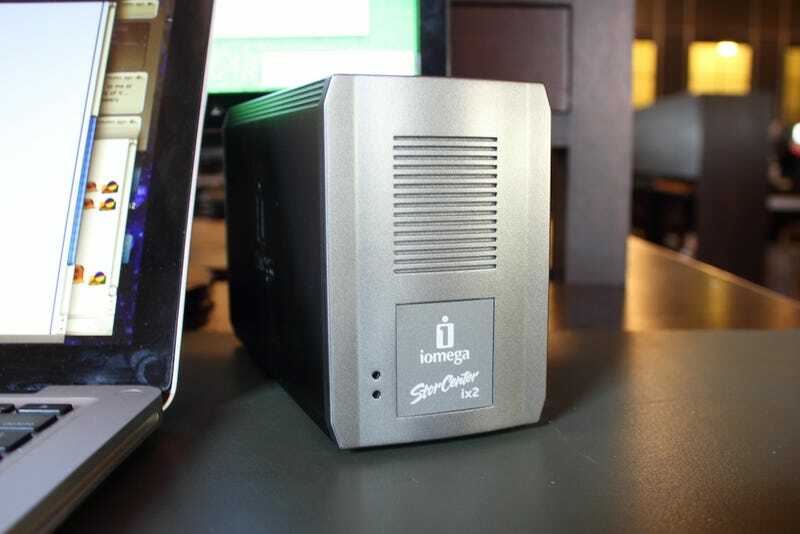 • My DIY system was concocted using FreeNAS software and an older ThinkPad I had lying around. This was technically the cheapest of the bunch. • My router-based system was an AirPort Extreme with attached WD and LaCie USB drives, which was also "recycling" but cost a bit more. • The dedicated NAS appliance I tested was a two-drive Synology DS207+, $330 for the box but the drives themselves are sold separately. If you're reading this, you've probably already got your NAS, sitting there on your desk, power light dimly mocking you. So, sorry, let's move on. The easiest way to access your NAS from outside of your home network is to set up an FTP server. Setting up the NAS for remote FTP access is as easy as enabling the feature in the device's control software. Actually getting to the device from outside your network is a bit harder. FTP is an acronym you might recognize from elsewhere. In layman terms, it's the developer's way to access a web server, rather than the user's. (HTTP.) It's a gross oversimplification, yeah, but here's the part that matters: FTP access lets you see files on a server as if they're in a networked folder. Accessing the FTP server from within your network is as easy as typing your NAS's IP address into an FTP client; doing so from outside takes a bit more work—specifically, you'll need to forward port 21 to the network address of your NAS. Instructions here. Once your ports are open, you'll be able to access your files from an FTP client like Filezilla, by entering the external address of your home network, followed by port 21. You can ascertain this IP address from a home computer by visiting this site. When Time Machine came around, it blew most other Mac backup utilities out of the park, at least in terms of ease of use. One problem: The only network attached storage device it works with, ostensibly, is Apple's Time Capsule. What if you have another NAS? Here's a simple guide to tricking Time Machine into saving backups to any NAS device, regardless of who made it. A lot of NAS devices offer streaming to Xbox and PS3 devices, but what they don't do is convert your videos to be compatible with your console. Before dumping your videos on your NAS for streaming to a console, you'll need to make sure they've been converted to an appropriate format. The Xbox 360 and PS3 now support a multitude of file formats, so consult these guides (Xbox, PS3) before converting any video. If your files aren't encoded in the appropriate format, the safest bet is to convert them to h.264 videos with an .mp4 file extension. But you don't have to worry to much about the specifics here—just download the free video conversion utility Handbrake, which has video conversion presets for the major consoles. One of the great things about network attached storage is that it operates through a network interface, meaning that you don't need to worry about the actual format of your file system, since it's only seen by the NAS's OS, which passes data through to other devices on your network via common network protocols. Most NASes let you connect just as easily from a Mac as from a PC, but when you're setting up your NAS, it's worth checking into exactly which protocol your box will be sharing with. Running only AFP is no good unless you've got a Mac-only home network. Running AFP parallel to SMB. though, will make transferring files from your Mac to your NAS, or vice versa, so much more bearable. RAID sounds like vaguely scary, like something you to do a French village if you're a Viking or what you do on a Saturday night if you're a lonely, sad person, but really it just stands for redundant array of independent disks. Which really just means a bundle of hard drives acting like one superharddrive. RAID 0: This is the version of RAID that turns multiple hard drives into a single hard drive, allowing for faster reading and writing, since multiple physical drives are doing the work of one. It's not really worth your trouble in a NAS context, since your speed is most likely going to be limited by network bandwidth, not hard drive limitations. Plus, it's risky: If one drive fails, the data on both is basically useless. RAID 1: This is the RAID that's most useful in a NAS, since it mirrors data, rather than striping it. Any data written to a RAID 1-configured NAS will actually be written twice, to both drives in the array. You cut your potential space in half, but think of it this way: All your data is automatically backed up, all the time. In conclusion, go RAID 1 or don't worry about it. Chances are you're using your NAS for backup anyway, so the added redundancy might feel a bit excessive. So that's about it! Like we said before, if you have more tips and tools to share, please drop some links in the comments—your feedback is hugely important to our Saturday How To guides. And if you have any topics you'd like to see covered here, please let me know. Happy NASing, everyone!